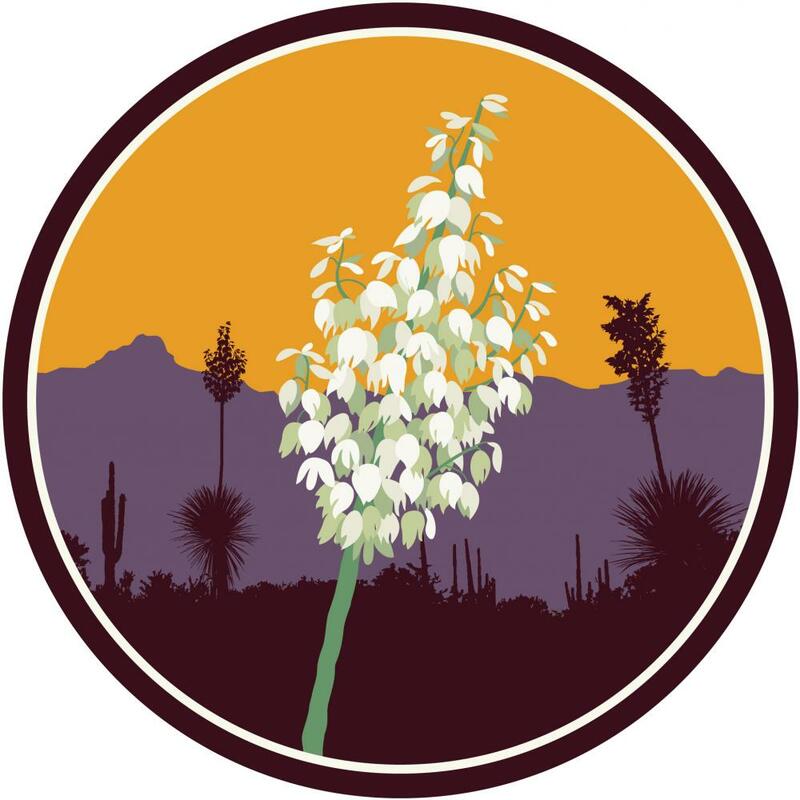 Southwest Season Trackers is a partnership between researchers and volunteers to improve models that predict how plants in the southwest U.S. will respond to changing climate and also to enhance efficiency of landscape restoration and management efforts in the region. For example, phenology can tell us when to harvest fruits of native plants, when to apply herbicides to unwanted shrubs, and when allergy season will begin. Phenology records in southwestern ecosystems are not as common as they are in other parts of the country. 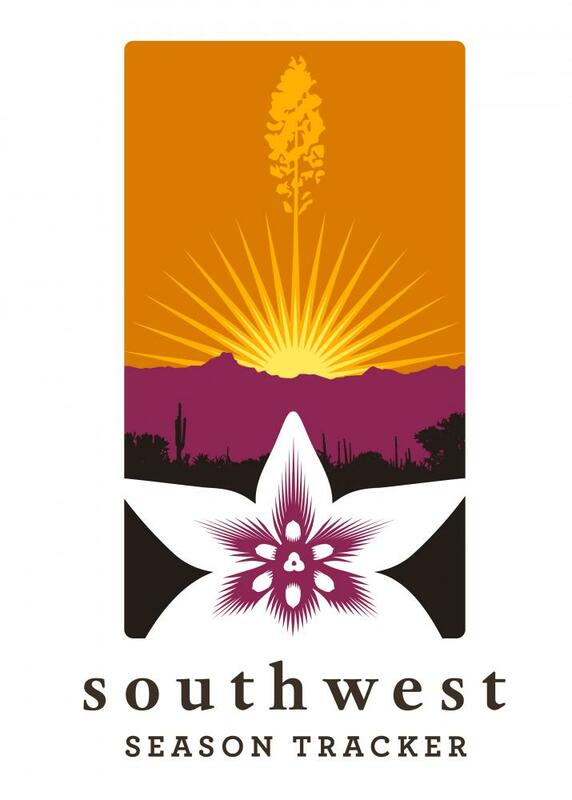 Southwest Season Trackers was created to engage the Southwest community to bolster efforts of USDA Agriculture Research Service (ARS) scientists to assess and improve performance of models that predict timing of seasonal activity in common shrub and grass species. We need your help to increase our understanding of the environmental conditions that signal plants to start growing, to flourish, to flower, to produce fruit, and to shut down. 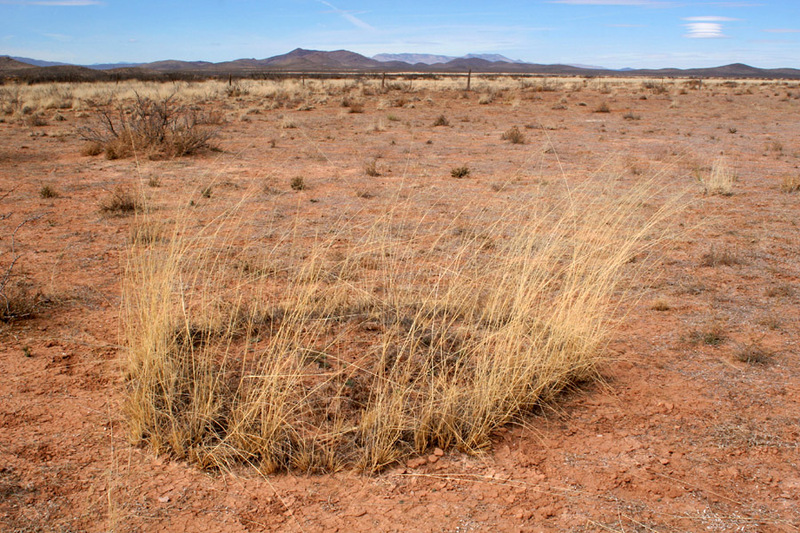 Your observations contributed to Nature’s Notebook will be used to verify predicted dates of start and end of the growing season based on an ongoing six-year study of plant phenology on the Jornada Experimental Range in southern New Mexico. We can then better understand what transitions the models characterize well and where we can improve our predictions of plant phenology for Southwest species. 1. Select one (or more) of the species to track from the list above. 3. Sign up to receive our Southwest Season Trackers campaign messaging (in the right sidebar of this page - you may need to scroll back up to see it). You will receive messages approximately every 4-6 weeks during the growing season, providing early results, encouragement, observation tips, interesting links, and campaign-specific opportunities. Don't miss out! 4. Take observations. We invite you to track leafing, flowering and fruiting in your plants ideally 2-4 times a week. 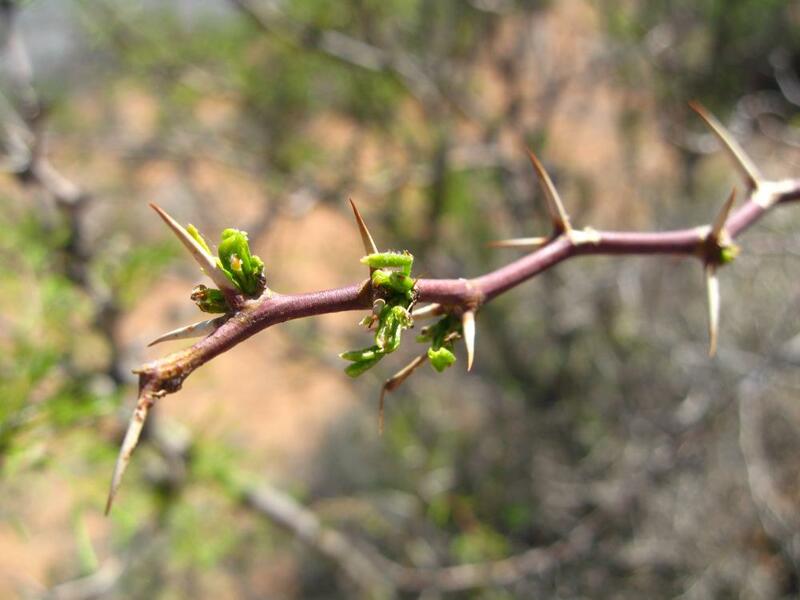 For the drought-deciduous shrubs, we are especially interested in the following phenophases, though you are welcome to report on all phenophases. Young leaves One or more young, unfolded leaves are visible on the plant. A leaf is considered "young" and "unfolded" once its entire length has emerged from a breaking bud, stem node or growing stem tip, so that the leaf stalk (petiole) or leaf base is visible at its point of attachment to the stem, but before the leaf has reached full size or turned the darker green color or tougher texture of mature leaves on the plant. Do not include fully dried or dead leaves. Flowers or flower buds One or more fresh open or unopened flowers or flower buds are visible on the plant. 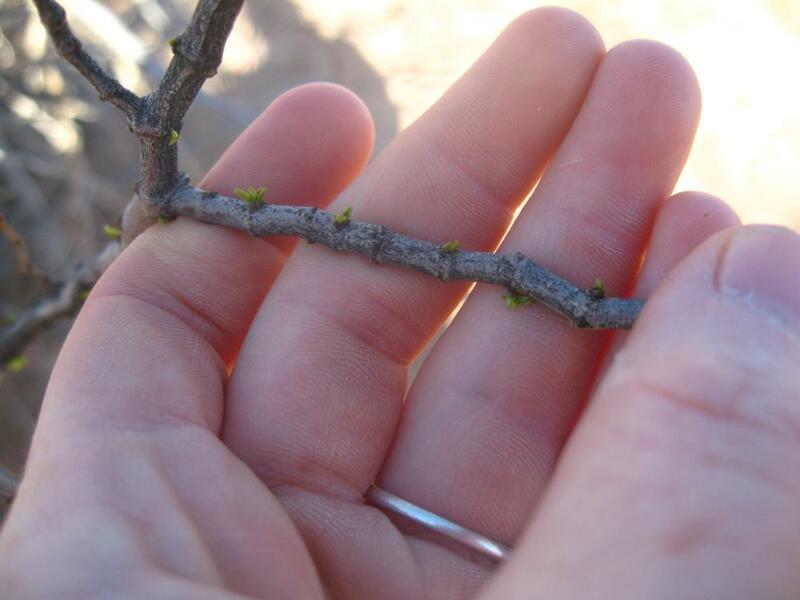 Include flower buds or inflorescences that are swelling or expanding, but do not include those that are tightly closed and not actively growing (dormant). Also do not include wilted or dried flowers. Open flowers One or more open, fresh flowers are visible on the plant. Flowers are considered "open" when the reproductive parts (male stamens or female pistils) are visible between or within unfolded or open flower parts (petals, floral tubes or sepals). Do not include wilted or dried flowers. Fruits One or more fruits are visible on the plant. For the evergreen shrubs and plants, we are especially interested in the following phenophases, though you are welcome to report on all phenophases. For the grasses, we are especially interested in the following phenophases, though you are welcome to report on all phenophases. 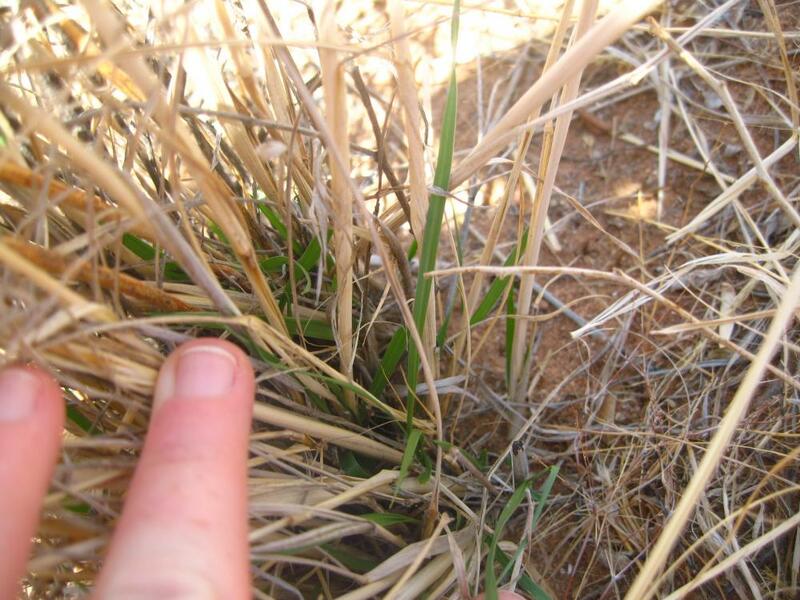 See more photos to help you identify the grass species on the Southwest Season Trackers list. 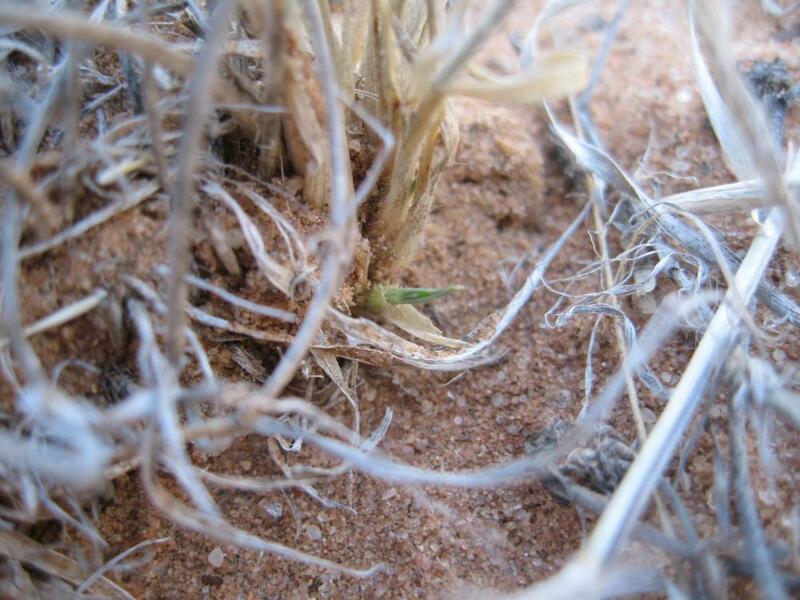 Inititial growth New growth of the plant is visible after a period of no growth (winter or drought), either as new green shoots sprouting from nodes on existing stems, or new green shoots breaking through the soil surface. For each shoot, growth is considered "initial" until the first leaf has unfolded. Leaves One or more live, green, unfolded leaves are visible on the plant. A leaf is considered "unfolded" once it unrolls slightly from around the stem and begins to fall away at an angle from the stem. Do not include fully dried or dead leaves. Flower heads One or more fresh flower heads (inflorescences) are visible on the plant. Flower heads, which include many small flowers arranged in spikelets, emerge from inside the stem and gradually grow taller. 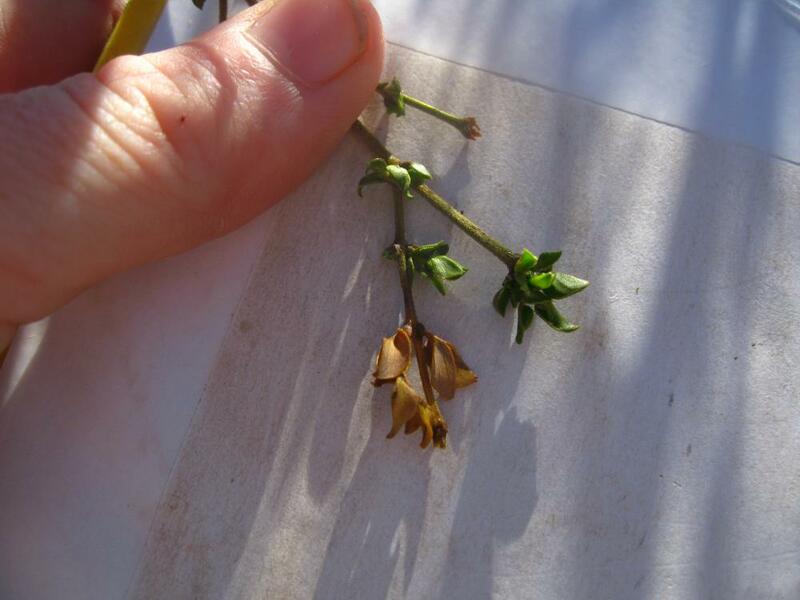 Include flower heads with unopened or open flowers, but do not include heads whose flowers have all wilted or dried or begun to develop into fruits (grains). Open flowers One or more open, fresh flowers are visible on the plant. A flower is considered "open" when reproductive parts (male anthers or female stigmata) can be seen protruding from the spikelet. Do not include flowers with wilted or dried reproductive parts. 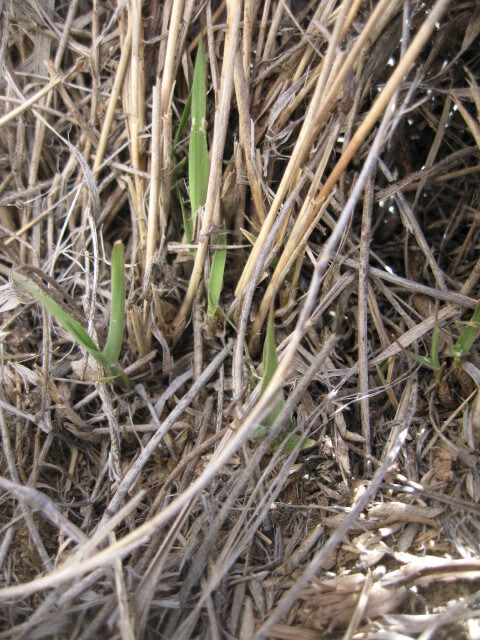 purple threeawn (Aristida purpurea): Mature leaves are revolute (rolled up like a burrito). Dried leaves have a purplish caste. The fruits have 3 slender appendages (awns) oriented like a propeller which aid in dispersal. 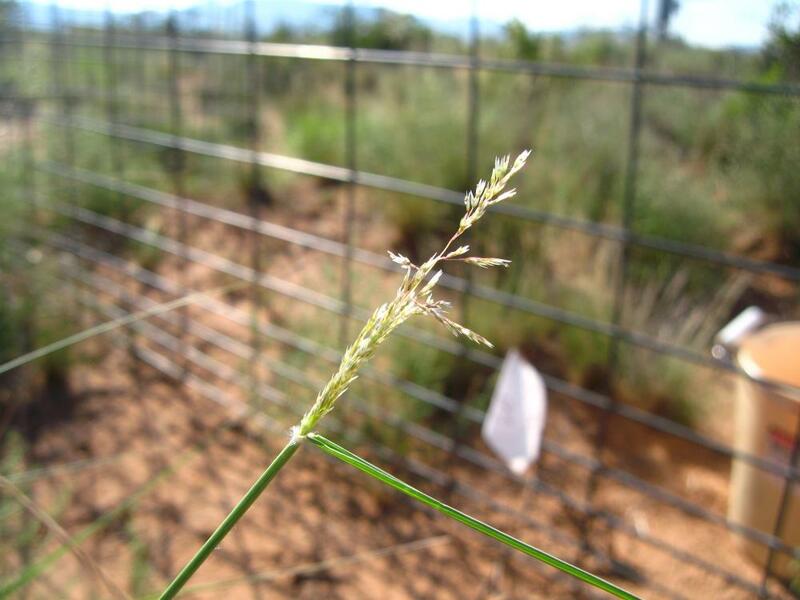 black grama (Bouteloua eriopoda): Easily and consistently identified by hairy internodes (stems). Dried leaves are gray, much like tobosa, but without the stout “troll hair” look to it. Can form dense colonies in sandy soils. bush muhly (Muhlenbergia porteri): Overall shape is usually rounded, “fluffy,” and broad. Often dried leaves turn to a muted maroon. Flower head is an open panicle, with a single fruit at the end of each terminal panicle branch. 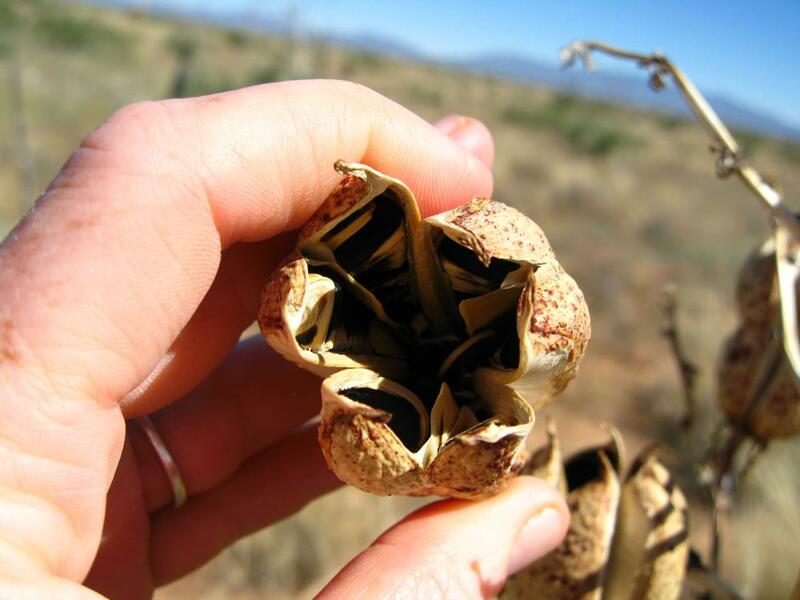 It often prefers to grow in the shelter a nurse plant such as mesquite, creosote, tarbush, or even chollas. tobosa (Hilaria mutica): Often found in large colonies on or near clay flats. 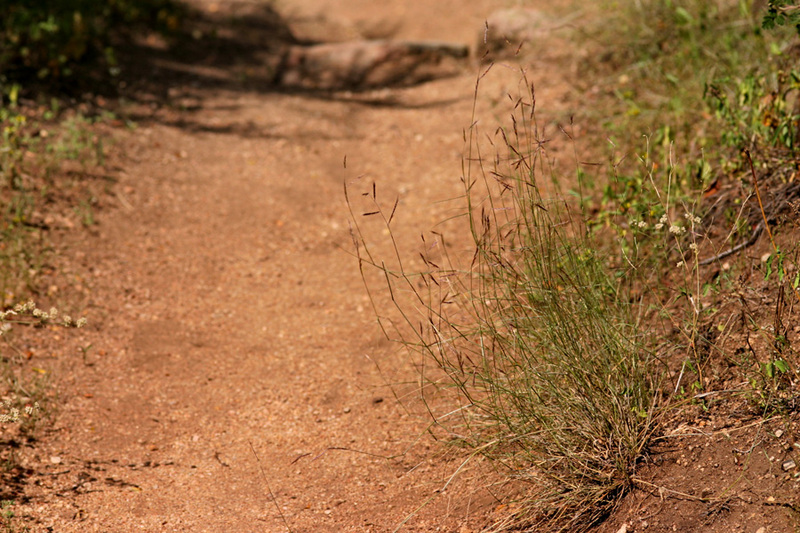 Dried leaves are a gray hue with a characteristic unkempt “troll hair” look from afar. 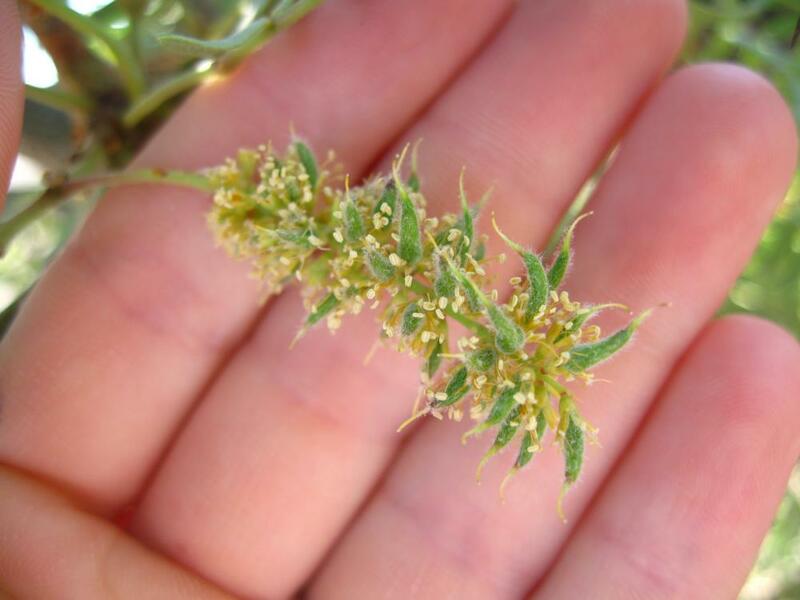 The flower head terminates in a dense, shaggy spike (more akin to wheat or barley) rather than an open panicle that is about 1-1.5 inches in length. 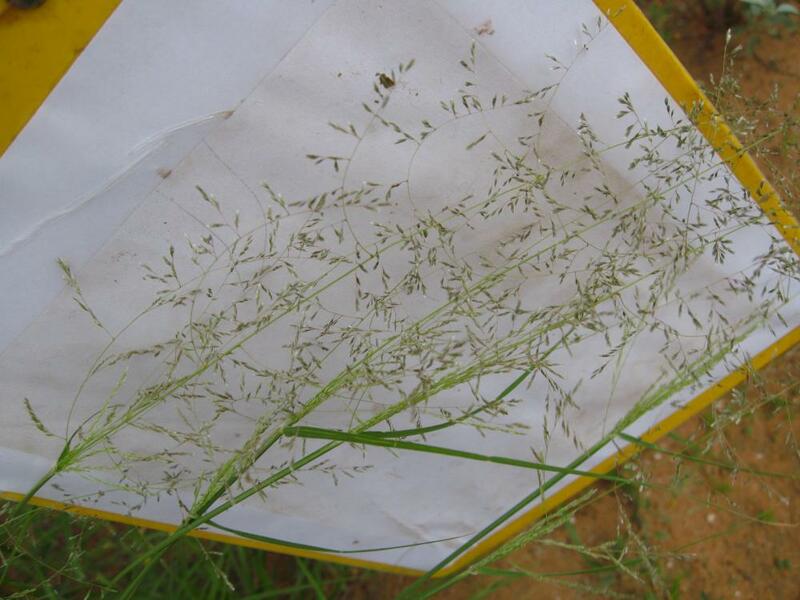 alkali sacaton (Sporobolus airoides): It can be difficult to distinguish spp. of Sporobolus without a flower head (inflorescence) but all have open leaves at maturity (in contrast to purple threeawn) and all have hairy ligules (the region where the leaf emerges from the sheath). The inflorescense is an erect, open panicle. Dried leaves have a straw color. 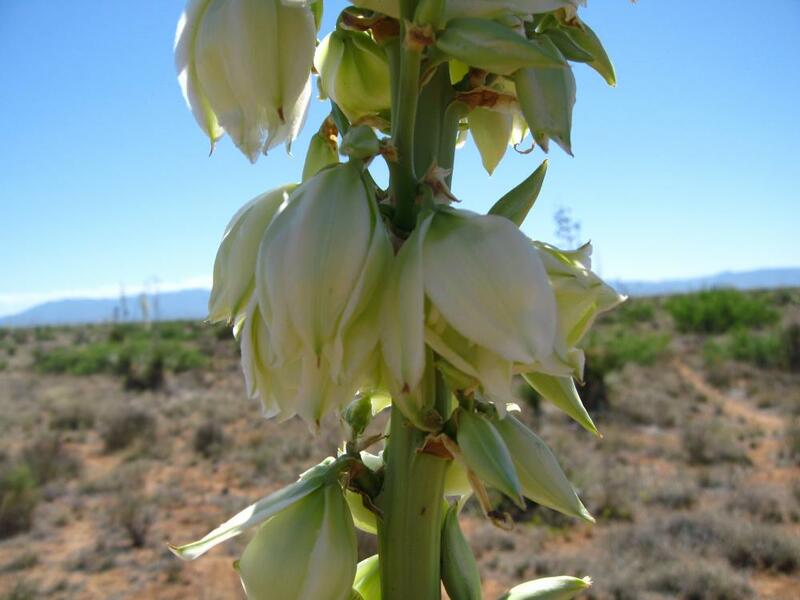 Broadly distributed, but is common in Chihuahuan desert grasslands, the edges of playas or other drainages, and has an affinity for saline soils. spike dropseed (Sporobolus contractus): Has a tight, narrow panicle, that looks more akin to a wheat flower head than to the other dropseeds of interest to SWST that can easily exceed 6 in. in length. Often grows in sandy soils, among creosote or mesquite dunes. Dried leaves are a straw color and have hairy ligules. 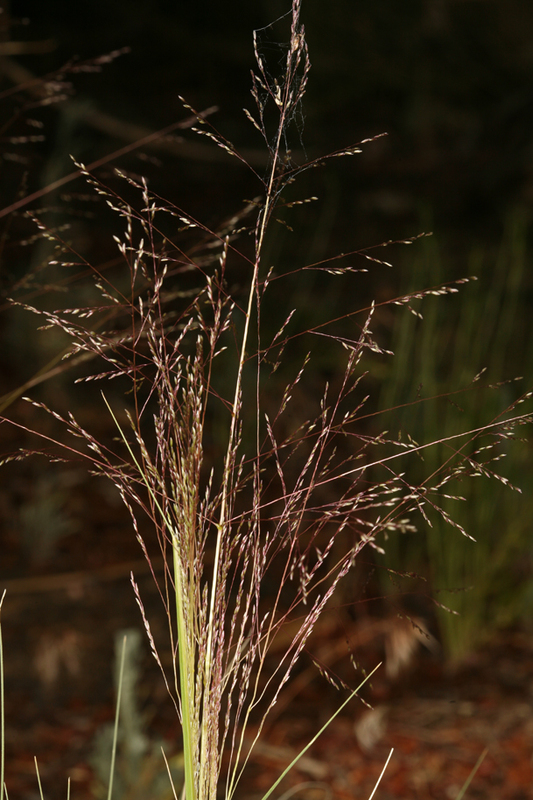 mesa dropseed (Sporobolus flexuosus): Has an open flower head (inflorescence) like alkali sacaton, but is usually nodding and ‘tangled’ due to tiny appendages in the inflorescence branches that render it clingy/sticky (alkali sacaton lacks these appendages and is not clingy). Has hairy ligules, like other dropseed spp. and dried leaves have a straw color. 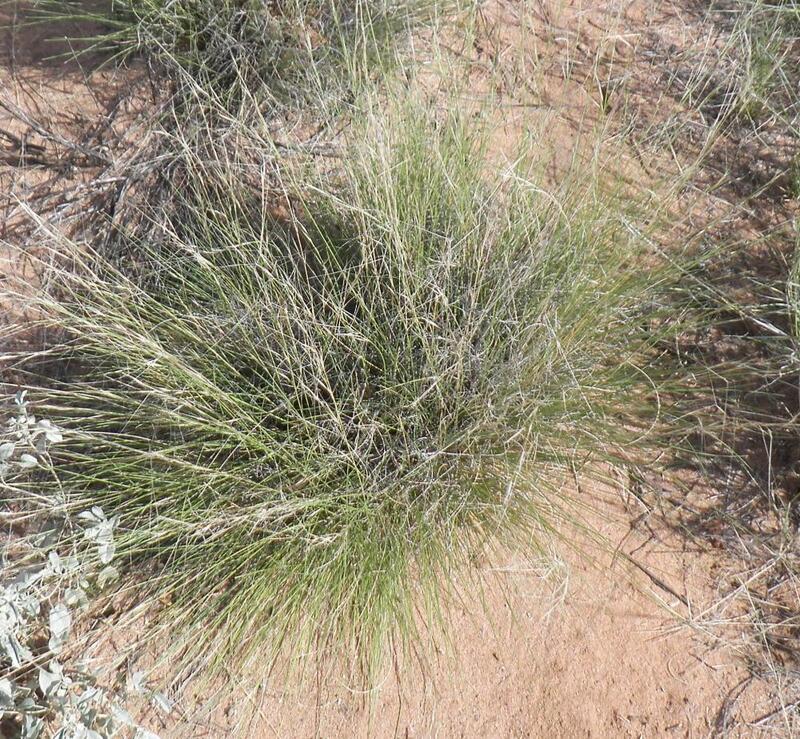 It is often found in sandy soils, and seems to have less of a water requirement than alkali sacaton. Over the first three years of the campaign, 264 observers contributed 62,181 observation records for Southwest Season Trackers species. 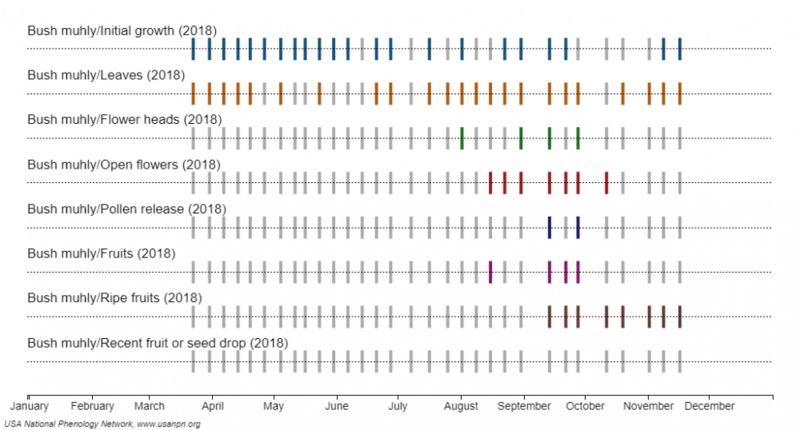 29 observers contributed data in all three years, and another 48 observers contributed data in two of the three years. 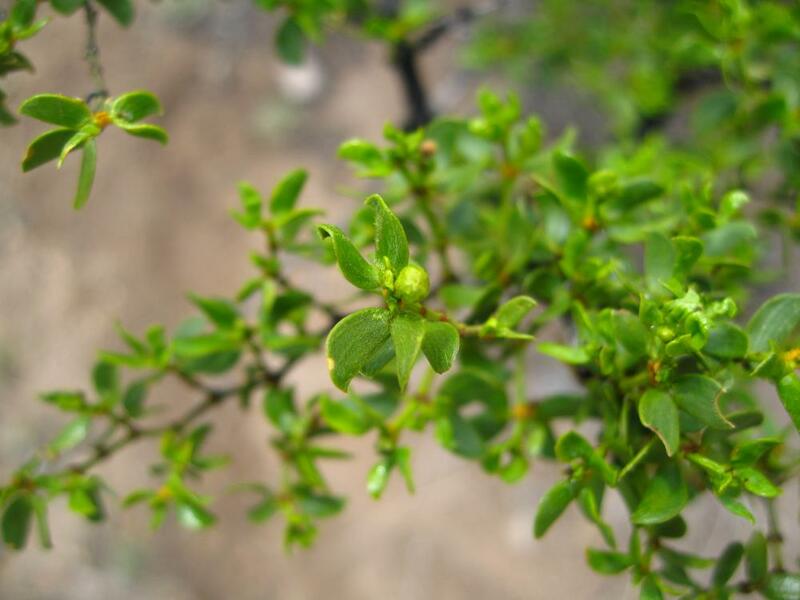 The most observed species was creosote bush, followed by honey mesquite and soaptree yucca. In 2018, 119 Southwest Season Trackers observers reported on 11 species at 68 sites across 5 states. 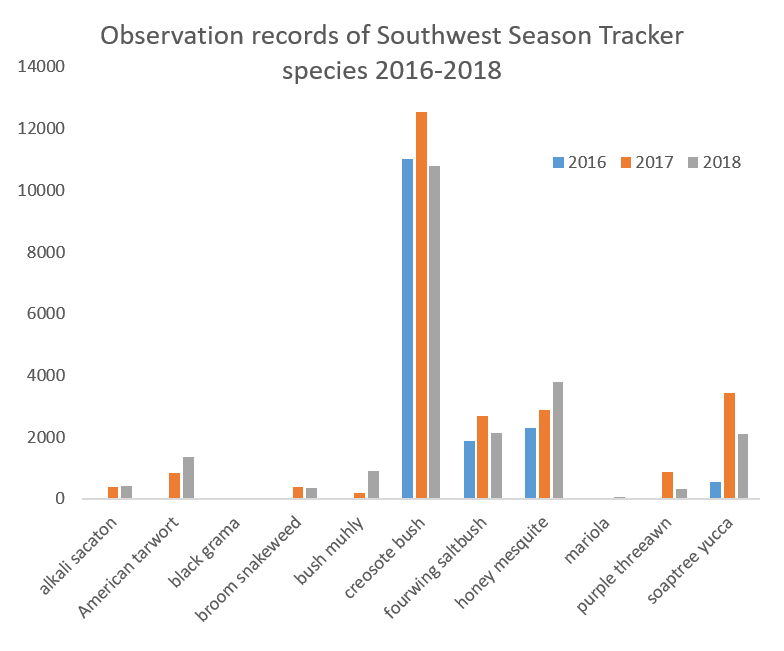 Sites reporting on Southwest Season Tracker species in 2018. Site colors correspond to the species indicated at the top; darker colors represent more records collected and green outlines indicate that site is observing more than one species. 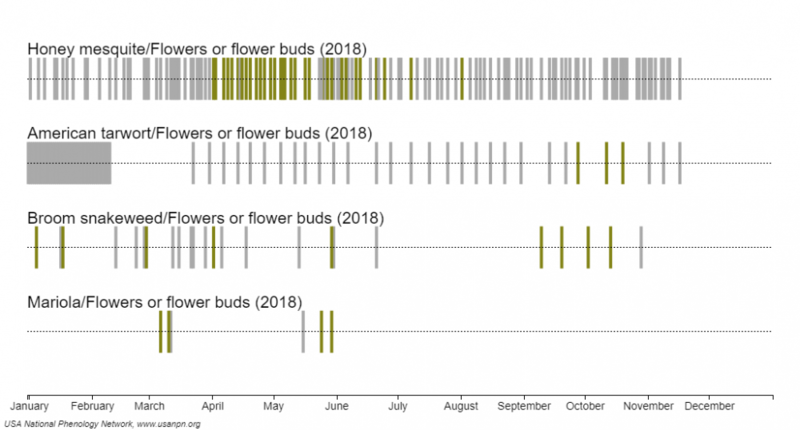 Observers reported flowers of flower buds for three evergreen shrubs this year. 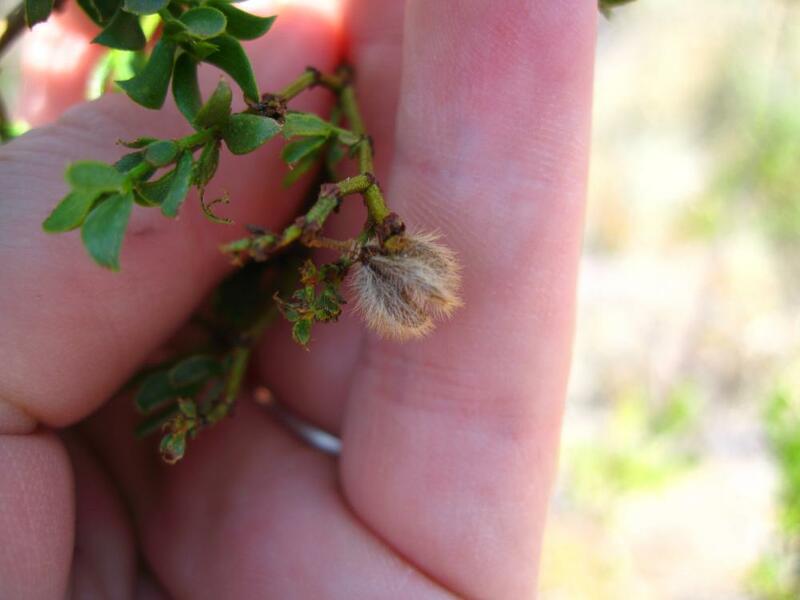 While flowers were reported for creosote bush in all months of the year, fourwing saltbush and soaptree yucca exhibited more limited flowering periods. 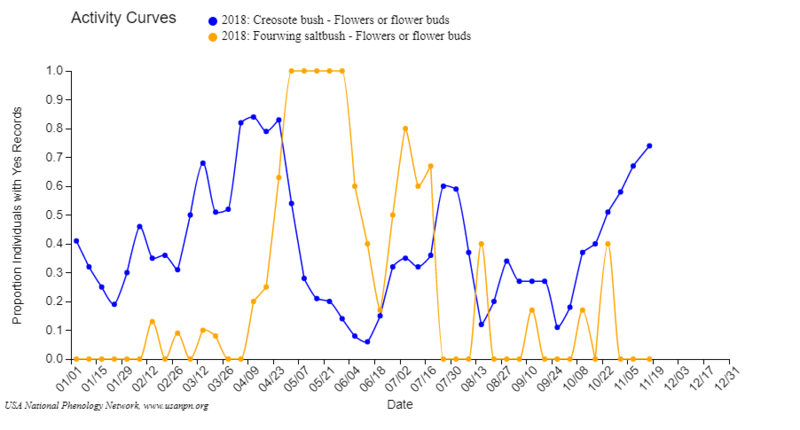 Looking more closely at flowering reports for creosote, we can see the proportion of individual plants with yes records was highest in March and April, with a second peak in October. Fourwing saltbush exhibited a peak in flowering in April, and a smaller peak in July. 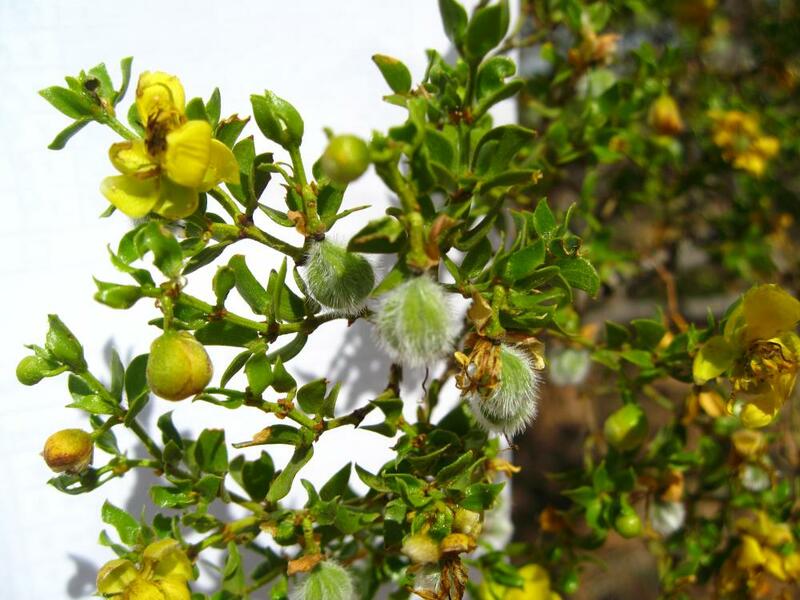 Observers reported flowers or flower buds for four drought-deciduous shrubs this year. 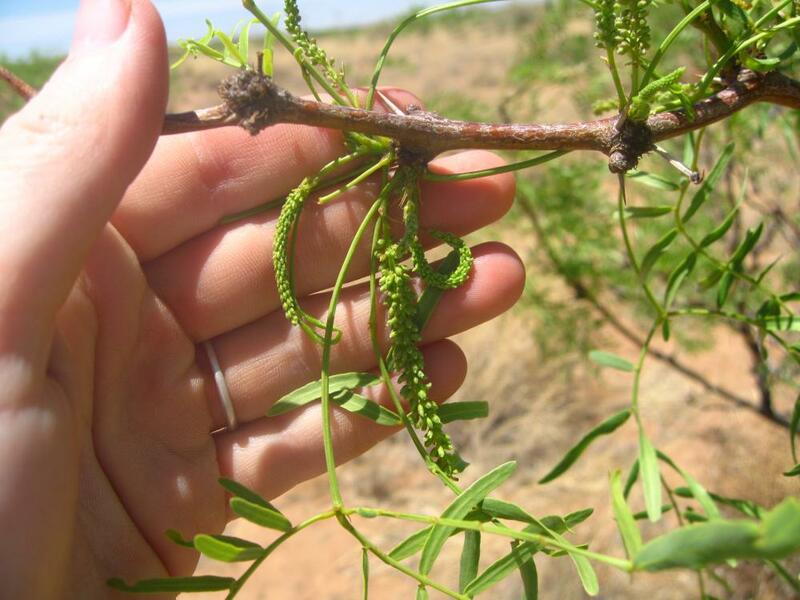 Flowering of honey mesquite, american tarwort, and mariola was limited to a shorter time period, while observers reported broom snakeweed in all seasons. 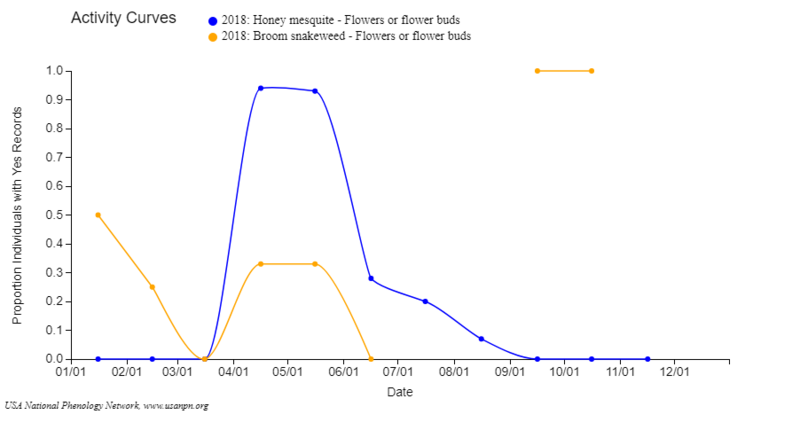 The proportion of honey mesquite individuals with yes records peaked between April and June. 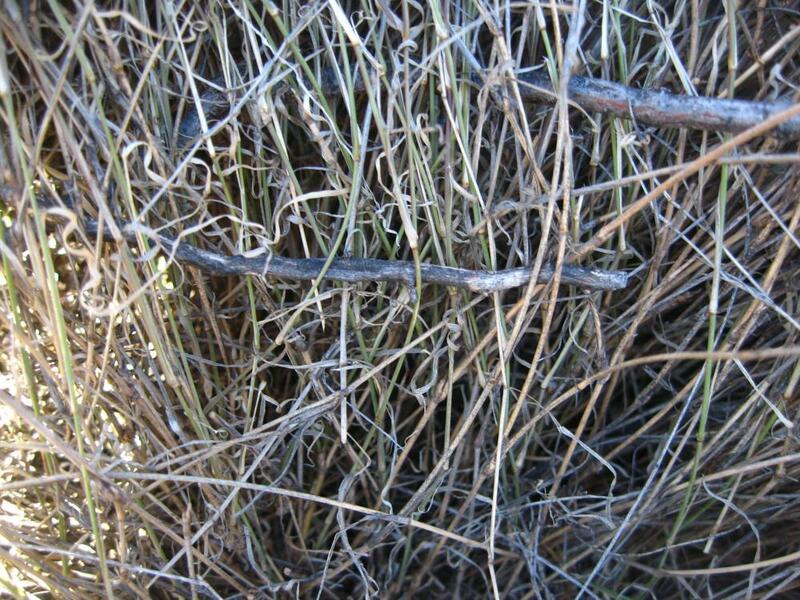 For broom snakeweed, observers reported high flowering activity in January, between April and June, and in October. 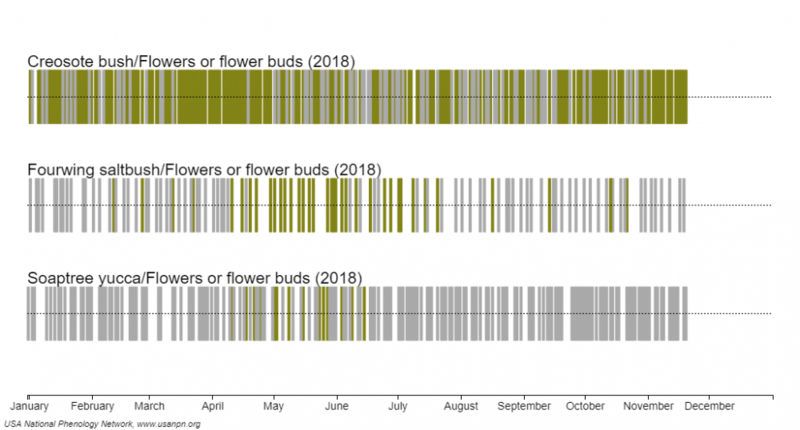 In 2018, observers also reported on the phenology of grasses such as bush muhly. 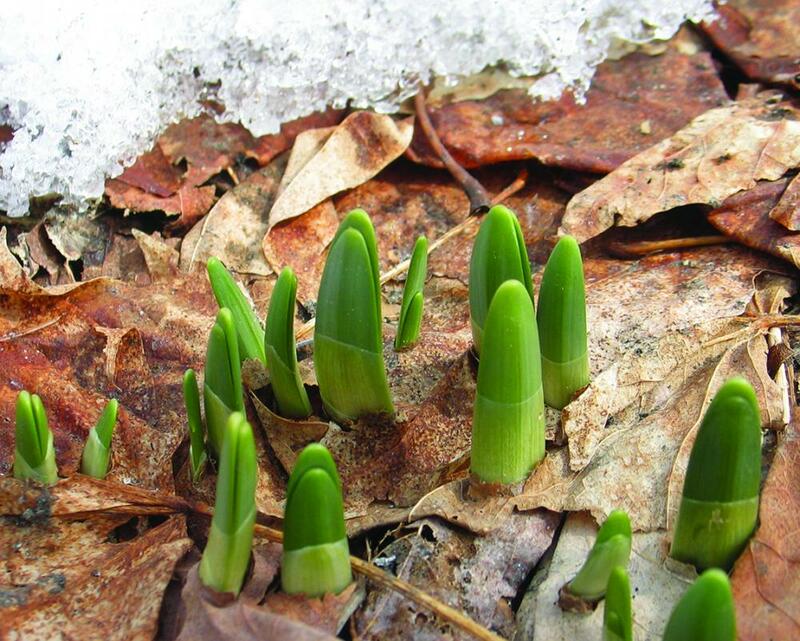 Observers reported initial growth and leaves throughout the year. Flowers were reported in July and August, and fruits were reported in the fall. Want to learn more about initial growth? 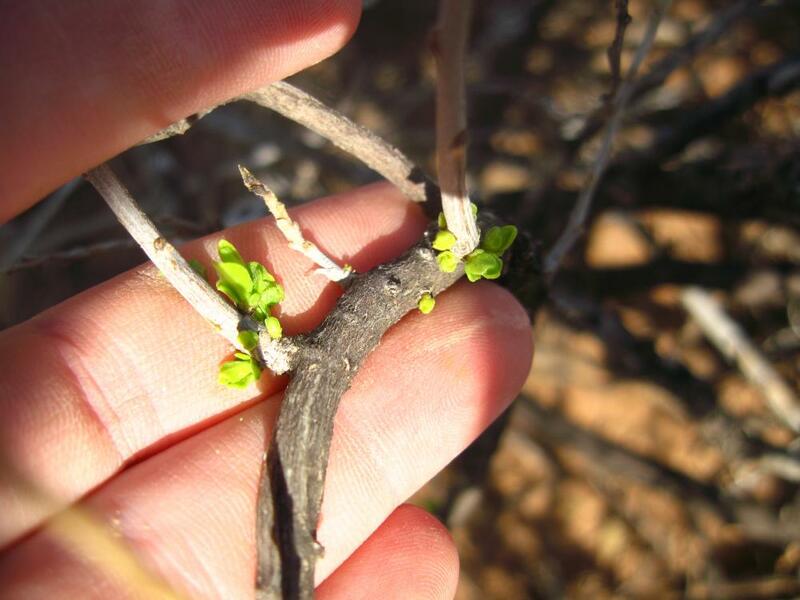 Our Nature's Notebook Nugget takes a magnifying glass to the phenophase of intial growth. Learn when to start and stop reporting this tricky phenophase! You can earn this badge by observing one target Southwest Season Trackers species in six separate weeks, within the same year. See it on your Observation Deck.